I’ll get your attention by saying that Dave Mihaly has done time as percussionist in Mushroom, having played on a half dozen of their albums. 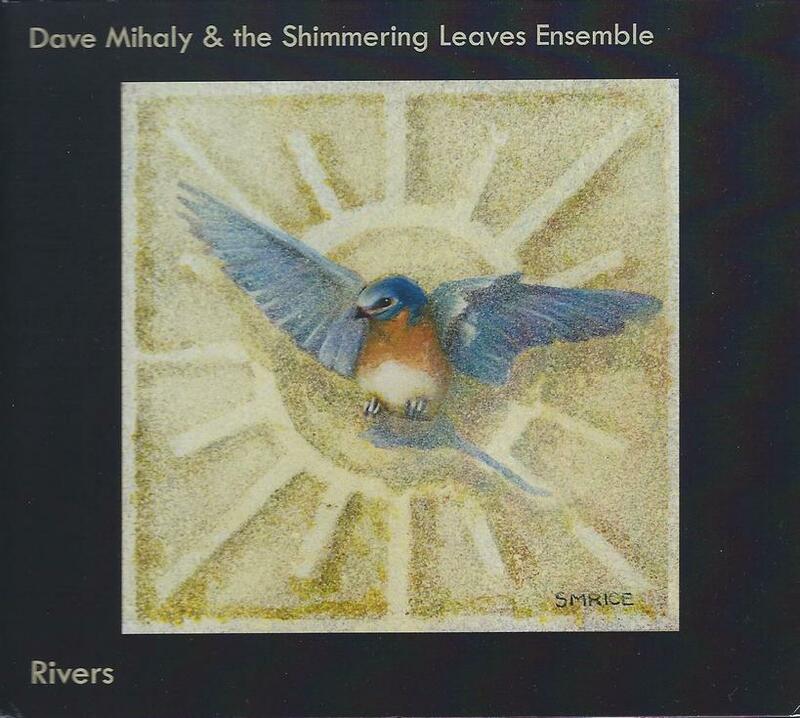 Rivers is the second of his Shimmering Leaves Ensemble albums and features an interesting and varied collection of steadily brewing free-jazz, ambient-jazz, and vocal numbers. But that’s a simplistic description of this 13 track collection which is ultimately difficult to adequately describe. I like the acoustic guitar and percussion rhythms which inject a strange but pleasant vibe on Oil Painting for Adolphe Sax & Coleman Hawkins. The viola sings and the horns blow some jazzy swing. Other highlights include A Bientot, a melancholy viola, trumpet and acoustic guitar instrumental, best described by the last line of the CD notes – “like wisteria and Spanish moss drooping down from hazy rafters some golden afternoon.” There’s an element of free-form experimental exploration on Mudang, yet it’s accessible and pleasant, with mildly wailing and singing horns that are efx’d and may even be looped. It’s all very slow and understated with a beautiful drifting ambience. Willoughby and Red Mask features an avant-jazz combination of high energy drumming, dueling trumpet, sax and viola, and old time funky wah’d guitar. Among my favorites is Honu, which after an avant-jazz inspired mariachi intro transitions to ambient guitar, viola and horns backed by free-jazz drumming. This is a perfect warm-up for the 9 minute multi-faceted title track, which consists of a cool grooving blend of lounge jazz and Coltrane, a lovely trumpet and singing viola duet, and acoustic guitar tripping along slowly to free-jazz percussion and an underlying tension laden ambience, which gets nicely screechy and borders on the psychedelic. Lots happening here. There are also 4 vocal numbers. I’m not good at singer-songwriter analogies but The Cat Tried to Catch a Hummingbird is like a Tom Waits song with tastefully jamming sax and whimsical percussion. The one that really caught my attention, though, is Cherry Blossom Road, with its spacey ambience and distant ghostly viola that surrounds Dave singing along to slowly soloing electric guitar. In summary, an interesting set that I wouldn’t begin to know how to classify. Jazz fans may be intrigued. Singer-songwriter fans might get confused. Adventurous types with cross-genre tastes will find much to enjoy across repeated spins.